I have written a complete tutorials series on WorkManager. In this series, we explained about WorkManager, How’s it’s working, and explained how run tasks under specific conditions using WorkManager. In this tutorial, I’m going to explain how to schedule a recurring/repetitive task in Android. WorkManager is a task scheduler, it makes easy to specify the asynchronous task. The Work Manager API helps create the task and hand it to the Work Manager to run immediately or at an appropriate time as mentioned. WorkManager is support two type work. OneTimeWorkRequest and PeriodicWorkRequest. As per name OneTimeWorkRequest for non-repeating work. Mean if you want to enqueue requests for one time only then we used this WorkRequest. This WorkRequest used for repeating or recurring works. In Simple words, PeriodicWorkRequest works as cron job in android This type of work is repeating multiple times until it is cancelled. The first execution happening immediately or given Constraints. The next execution will happen as per the given interval. The minimum interval should be 15 min. It can be delayed due to OS battery optimizations and Not meeting all Constraints, such as doze mode, no network connectivity etc. 1. Let’s open android studio and create a new projects. 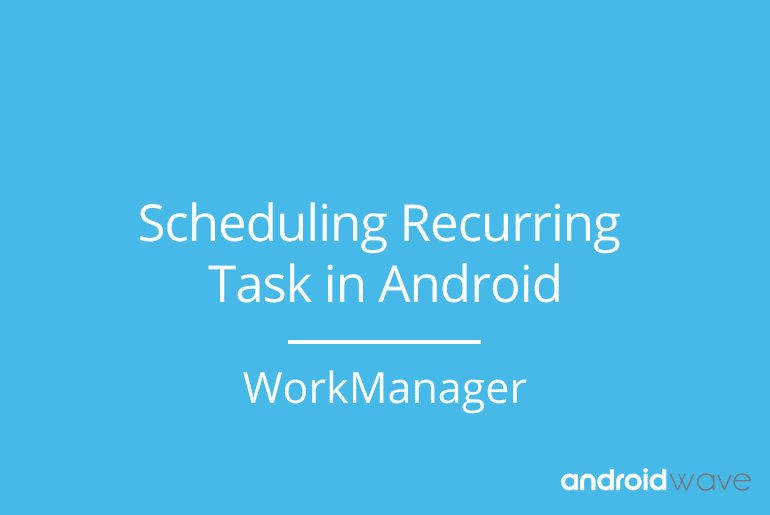 Now I’m going to demonstrate, how to scheduling recurring task in Android? How to enqueue the job and cancel the enqueue work? Go to file menu and create a new project with EmptyActivity template and add WorkManager dependency. Create a java class in src folder and extends Worker class. After that doWork() override methods and define work here. For now I’m creating request that be run every 15 min.